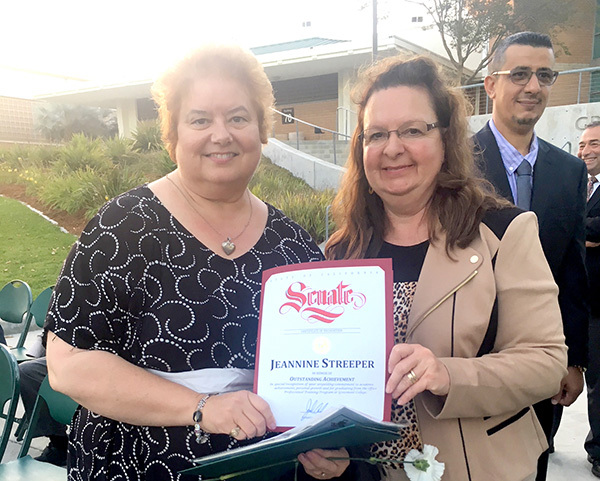 On June 11, friends and family gathered in the main quad at Grossmont College to celebrate the Office of Professional Training (OPT) program’s graduation. State Senator Joel Anderson provided the graduates with Senate certificates to recognize them for their hard work. “Programs like this get people on the path to achieving their dreams. I am inspired by the graduates’ commitment to mastering their skills to provide a better life for themselves and their families,” Anderson said. At OPT, students are given support from staff, faculty, and mentors, and job placement assistance. The program has a 75 to 80 percent success rate in helping their students get full-time employment. OPT is an intensive program, where students must complete 12 to 20 units in 17 weeks. On top of that, some students have families to take care of. Tina Emanuel, one of the OPT graduates, is a single mother of two. Emanuel explained that she went into the OPT program to seek a better life for herself and her family. “Before, I was just getting jobs here and there, not really sure what I was going to do, but it gave me the training and the confidence to go out there and say, ‘Yes, I can do it!’” Emanuel shared. Confidence is one of the most important things that staff and faculty makes sure their graduates receive in addition to their graduation certificates. Donna Dixon, OPT’s Interim Coordinator, says the most rewarding part of this experience is to see the students transform throughout the semester. “Most of the students come into the program with low self-confidence. And to see that confidence increase over time as they gain new skills and recognize their worth is extremely rewarding,” Dixon stated. To learn more about the OPT program, visit bit.ly/GrossmontOPT. —Rachel Corradini is a legislative intern for Sen. Joel Anderson’s office.